Currently, Linux operating system cannot detect the single NVMe SSD in RAID controller though the NVMe SSD actually does not belong to any RAID arrays. As to users who want to dual boot Windows and Linux will find the NVMe SSD cannot be detected when installing Linux system. Step 1 Press the Windows key and R key at the same time to open Run box. Then type msconfig and press Enter to open System Configuration. 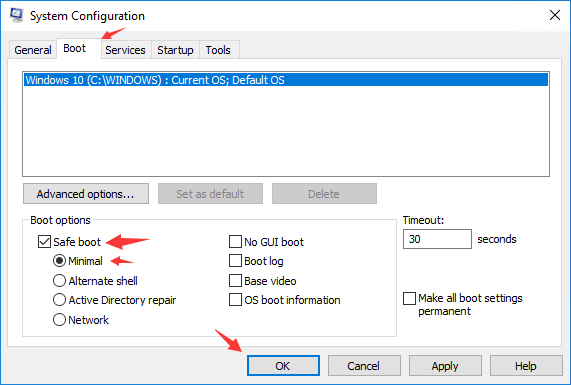 Step 2 In System Configuration, click Boot tab, select Safe boot and Minimal, and click OK button. Restart computer to apply these changes. Step 3 Enter BIOS to change hard drive controller mode to AHCI from RAID. Save changes and exit, and Windows will automatically boot to Safe Mode. Since the specific steps of setting hard drive controller mode differ from motherboard brands, we cannot list all of them one by one. You can consult manufacturers of your motherboard or computer regarding this issue. Step 4 Open System Configuration again, and click Boot tab. Unselect Safe boot, click OK button, and restart computer.